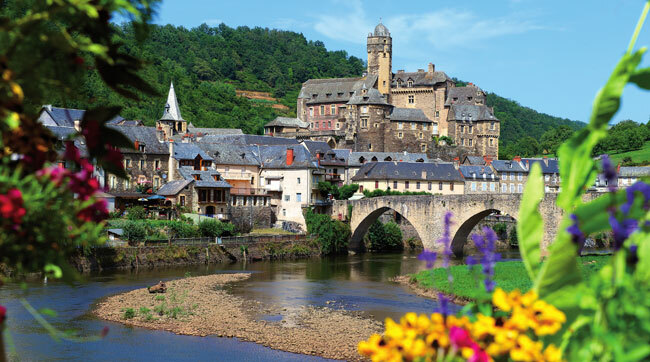 Nestling on the banks of the river Aveyron, this picture postcard village, with its bridge, church, and the 15th Century tomb of the Seigneur de Belcastel, will strike a chord in your soul. The remarkable château, dating back to the 11th and 15th Centuries, prevails over the village and was tastefully and passionately restored by the architect Fernand Pouillon, who also fell under Belcastel’s spell. 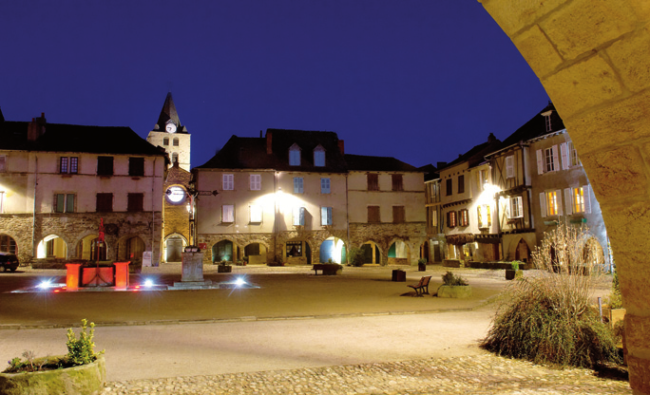 As night falls over Belcastel and its narrow cobbled streets, the lights from its charming houses, forges, kilns and magnificent château shine out like a thousand stars. Located at the confluence of two rivers, the name of this tiny village evokes both the unusual vegetation its first farmer settlers were confronted with and the fortress, which dominates the village. 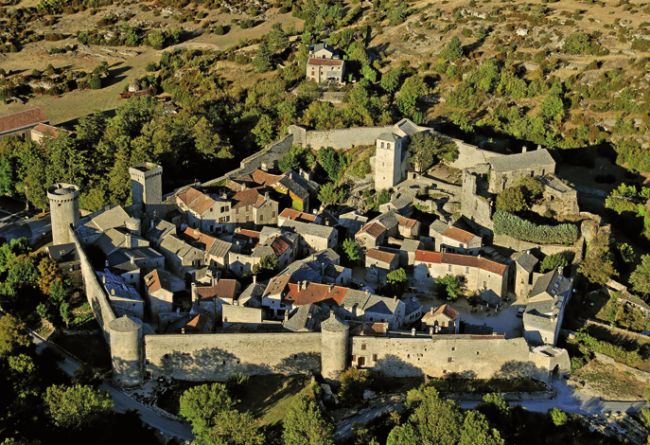 Perched on a rocky outcrop, the château fort was built in the 9th Century and from the Middle Ages it has kept its fortified walls, the road around its base, as well as its five defence towers. Its church, its oratory, its attractive houses and its Roman-style bridge all combine to make Broussele-Chateau a truly exceptional medieval village. The church with a fortified steeple was built in the 15th Century by Seigneur Jean III d’Arpajon and served as a stopping point for pilgrims en route to Santiago de Compostella. 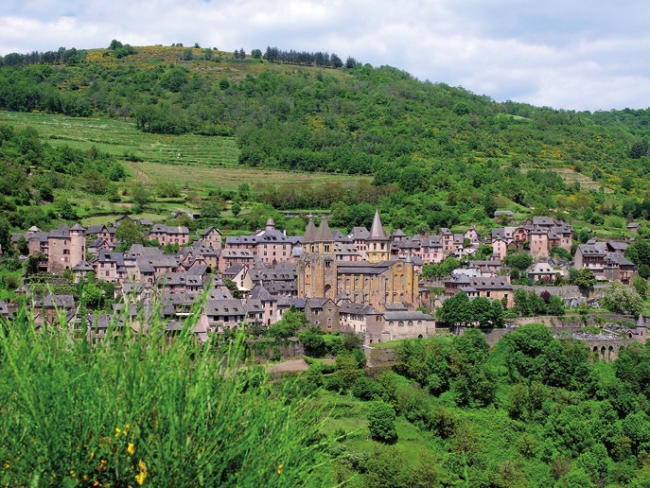 Also a well-known stopover on the pilgrimage to Santiago de Compostella, Conques is an exceptional jewel of Roman culture and heritage. The stained glass windows of the Abbey of Sainte-Foy, designed by Pierre Soulages, both respect and glorify Roman austerity and symbolism and its ancient vaults are also home a wonderful collection of Roman sculptures, including the very famous tympanum of the Last Judgement dating back to the 12th Century. The medieval village, which has slowly grown up around the Abbey of Sainte-Foy, will seduce you with the authenticity of its architectural heritage. This UNESCO world heritage site, acclaimed as a medieval town at Renaissance’s door on the Via Podiensis pilgrimage route to Compostella, nestles in the heart of the foothills of the Aubrac Mountains, surrounded by hillsides famous for their ancient wine terraces and not far from the renowned gorges of the Lot. 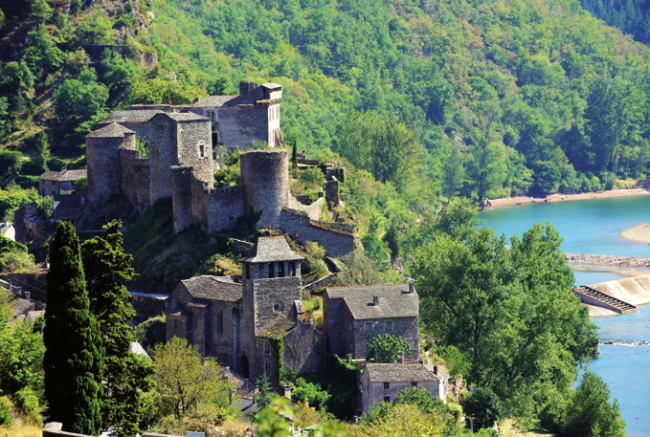 In Estaing, you will find true medieval ambience in Northern Aveyron. 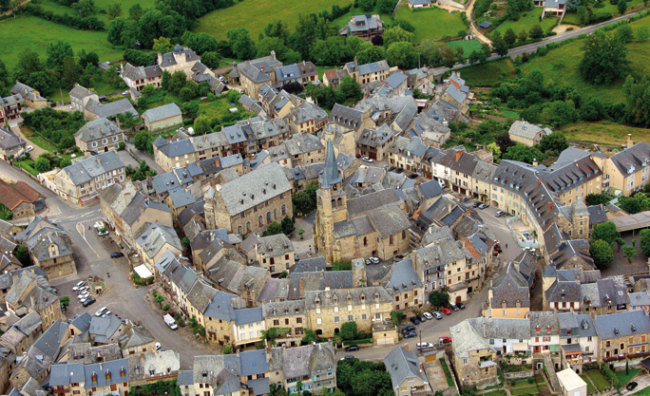 The village lies at the foot of the imposing château, which is now a cultural site owned by the Château d’Estaing SCI, represented by Viscount Giscard D’Estaing. The church dates back to the 16th Century and is dedicated to Saint Fleuret, bishop of Auvergne who died in Estaing in 621 and who is now the patron saint of the village. The church is home to Saint Fleuret’s relics and its sumptuous reredos contrast vividly with more sober contemporary touches, such as the stained glass windows and altarpieces by C Baillon. Saunter through the narrow village streets and walk straight back into history. Positioned high up on the Larzac limestone plateau, in the heart of the Grands Causses Regional National park, the architecture of la Couvertoirade reflects the strength of the orders of the Knights Templar and the Knights Hospitaller. 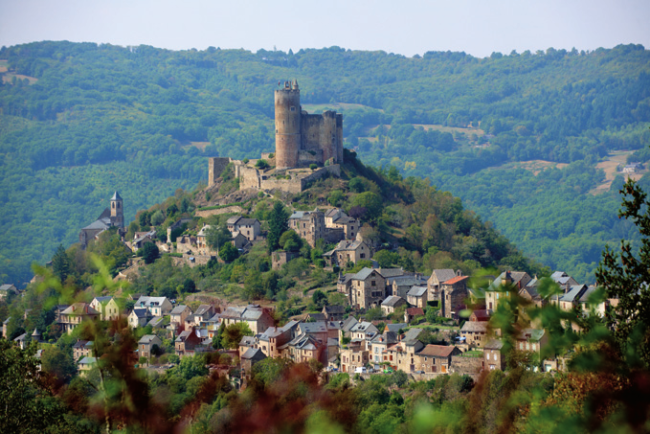 Built at the foot of the church, located on the rocher des conques for more than seven centuries, and the 17th Century château, the village boasts a fortified wall from the 15th Century and fine houses, typical of the area. A mountain village, perched on a bosky bower. The fortress which was once the envy of the Kings of France and England is quite simply a masterpiece of military architecture dating back to the 13th Century. 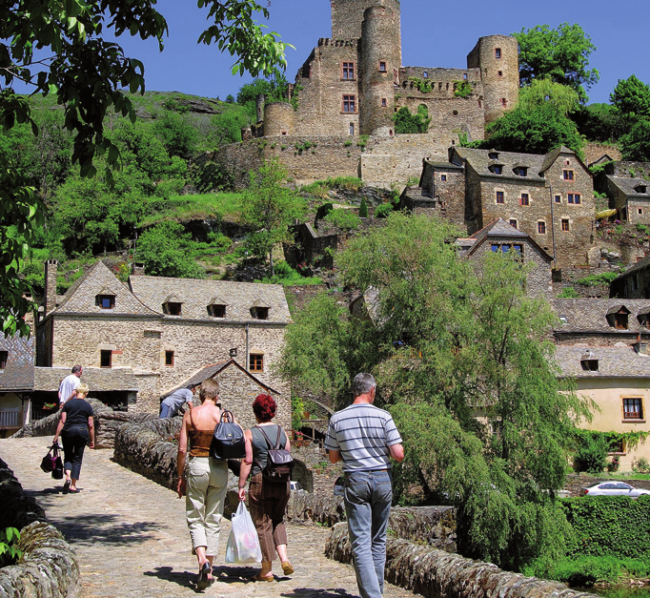 Standing at the far end of the rocky peak, with the river winding around its base, the keep overhangs the narrow gorges of the Aveyron and watches vigilantly over the village. The town itself is built slightly apart from the fortress along the single road which scales the hillside towards the château. Its historical humpbacked bridge, on the old road to Villefranche de Rouergue, allowed both merchants and pilgrims en route to Compostella to cross the Aveyron river in all seasons. A rupestrian village, quite out of the ordinary. 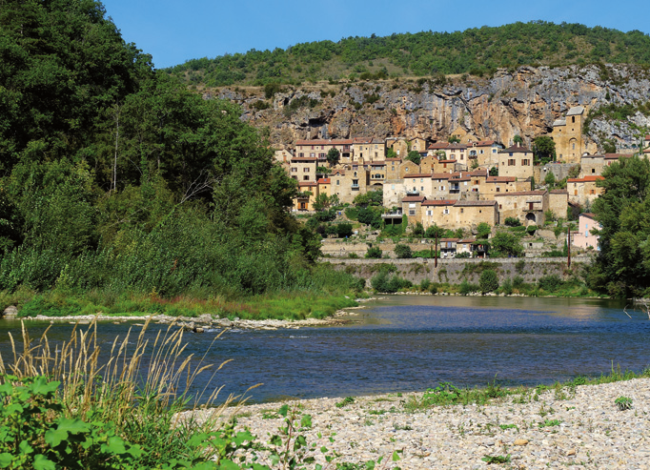 Remarkable in so many respects, Peyre is built on the side of an enormous tuff rock face, dotted with caves, and which towers over the right bank of the river Tarn. 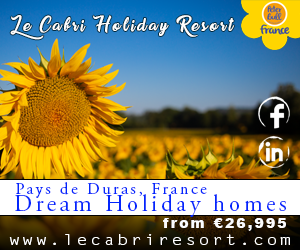 It would be hard not to fall under the charm of this unusual, stunning village with its exceptional views of the Viaduc de Millau and its perfect blend of ancient and modern. The recently excavated troglodyte church, dedicated to Saint Christophe, towers over the village, its steeple, a square and crenellated tower, giving an impression of protective reliability, serenity and eternity. A Knights Hospitaller village of age old tradition, still resounding with the footsteps of the pilgrims of Santiago de Compostella, this medieval village, with its crooked church spire, fortified doors and private hotels has remained unchanged for centuries. The architecture of Saint-Côme- d’Olt and the renovations, which it has been subject to during recent centuries, are such as to satisfy the most demanding of artists and connoisseurs. Over the “lauze” stone-slabroofed houses, the village lets the fine crooked silhouette of its church spire spiral upwards towards the sky. A land of ancestral traditions and a fishing paradise. 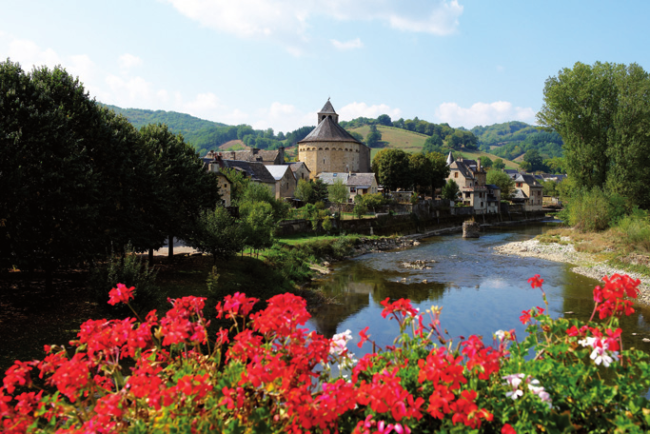 A medieval town on the banks of the river Lot, Saint-Eulalie-d’Olt charms its visitors with its pebble houses, lovingly bedecked with flowers. There is so much to discover, such as the Roman church, fortified and modified in the 16th Century, the Curières Château dating from the 15th Century, the mill with the vertical wheel and the sumptuous private mansion dating from the Renaissance with its unusual corner tower and which contrasts richly with the general harmonious sobriety of the town. As you wander along its winding narrow streets and investigate its small, shady town squares, you will discover the town’s history, its artistic heritage and artists’ studios. A walled town of art. A royal walled town dating back to the 13th Century and centred around the main square boasting forty-seven arcades, this town is an architectural gem. Visitors can escape the present day and admire the lovely half-timbered Renaissance style houses, ornamental sculpted stones, finely carved doors, the fortification remains, moats, towers and doors to the town. The town houses the famous Espace Laperouse, the heart of the Segala art movement, making Sauveterre de Rouergue a walled town of the art world.